Today we want to share a guest post for Memorial Day from BRAVO! friend and supporter, Cobb Hammond. Cobb writes about military history for his home town newspaper, the MEMPHIS COMMERCIAL APPEAL. As we commemorate Memorial Day, 2018, many may recall a battle a family member may have been wounded or killed in, or themselves a vet, may have lost a comrade in arms. It should be refreshed in our consciousness that our WW II veterans are dwindling in number, and on this weekend of remembrance it should be incumbent upon us to recognize a battle raging 73 years ago this month; The Campaign at Okinawa. This last battle of the War was not only the bloodiest of the Pacific theater but exhibited some of the most brutal and horrific fighting and battle conditions of the war; in that this was the first allied incursion on what was considered Japanese soil. This invasion was the first step in what was the initial phase before the eventual invasion of the Japanese home islands. The island of Okinawa was only 350 miles south of mainland Japan and was 463 miles square. It was populated by nearly half a million civilians and some 155 thousand Japanese troops of the infantry, air corps, and the navy, of which 80 thousand were front-line infantry troops. The strategic planning of the Japanese leadership before battle was to concentrate troops in several sectors that offered the most efficient use of troops—as well as the idea of inflicting the highest possible damage on US troops as they advanced. Northern Okinawa was defended by one-division, whereas the more challenging terrain of the south was defended by 3 additional divisions- as well as multiple specialized brigades. This area was turned into four heavily fortified, ‘hedgehog’ defense sectors, taking tactical advantage of the topography, and the dense emplacement of artillery and mortars made it the highest concentration of fire the enemy used in the Pacific War. Marines in Okinawa, 1945. Photo from Department of Defense Archives. The ideal defense employed by the Japanese commanders, were to allow all US ground troops to move well-inland, and then to defend every crag-laden hill, ridge line and ravine as our forces moved forward. This was a totally different strategy of previous island battles such as Iwo Jima and Tarawa, where the beaches themselves were heavily contested. Seemingly every ridge and hill contained natural caves and promontories; which typically had artillery encased inside steel doors and machine gun emplacements pointing down the fingers and draws of the hills. 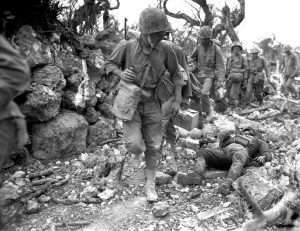 As the battle commenced on Easter Sunday, April 1, 1945, the two Marine divisions, plus a regiment landed on the central and eastern part of the island and attacked on a northerly axis, whereas the initial two army divisions wheeled south across the narrow waist of Okinawa. The Army’s 96 Inf. Division began to encounter fierce resistance from enemy troops on those rocky ridges very soon, as it slowly moved south. The Army’s 27th division landed on 9 April and took over the right, or western-side of the push south. There were now three army divisions attacking here. Enhancing the difficulty of the battle were the spring monsoon rains, which started in mid-April and didn’t let up until early June. The American foot soldier and marine became mired in mud and flooded roads, exacerbating the ability to supply men, evacuate wounded and navigating the steepening terrain. As Marine Corps regiments moved forward abreast, going to the aid of the army divisions pulled off the line for a brief respite, they—as their army brethren, encountered fanatical resistance from the Japanese defenders. Later, in the largest ‘banzai’ attack of the war, some 2,500 Japanese were killed, with some of the fighting devolving into hand to hand combat. As of now, five US Divisions were fighting south by southwest—going against these formidable defenses, footnoting places embedded in the memories of the brave souls doing the fighting, and now infamous in military lore. Names such as Sugar Loaf Hill, where 1,600 marines were killed and 7,400 wounded; Hacksaw Ridge- recently immortalized on screen, telling the story of Medal of Honor recipient Desmond Doss—and the formidable Shuri Line, where the Japanese planned their last defense in a series of ridgelines and strong points, taking the better part of a month to extinguish the enemy resistance. Fighting was so prolonged and intense in this area, that casualty counts are unable to be accurate, however it safe to say, tens of thousands of Japanese and easily over ten-thousand US troops became casualties of some sort. Not to be forgotten, was the intense combat at sea just miles offshore, as Japanese ships and kamikaze planes attacked US naval forces mercifully for weeks, with some 36 US ships sunk with another 380 damaged, as thousands of enemy pilots went down in fiery deaths. The morbid toll of he battle, which ended unceremoniously on June 22, 1945 was five-thousand naval personnel, 4,600 army and 3,200 US Marines, with total wounded exceeding forty-thousand. It should be noted that the Battle for Okinawa had more cases of combat fatigue and mental breakdown than any other battle of the entire Pacific War, as thousands were taken off the line- simply unable to continue. Japanese losses run as high as 140 thousand killed and additional one-hundred thousand civilians unfortunately perished in the crossfire of this hell. Denoting the widespread ferocity and valor exhibited in this campaign, 24 Medals of Honor were awarded; 14 posthumously, including one Tennessean. It should also be highlighted that the recent death of a friend of this writer, Memphis native William Phillips of the 7th Regiment, 1st Marine Division was a participant in this campaign. As we contemplate this solemn weekend, shall we remember the sacrifice of so many on the bloodied rocky dirt of Okinawa. 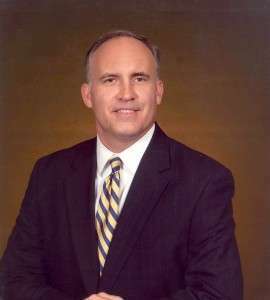 Cobb Hammond is a financial advisor with Hammond Financial Advisory/Money Concepts, Inc. He writes on military history and composes short stories as a hobby. You can reach Cobb at chammond40@yahoo.com. This link will take you directly to BRAVO!’s Amazon Prime site where you can take a look at the options for streaming: https://amzn.to/2Hzf6In. On this Memorial Day, millions of Americans will honor the American service members who gave the final sacrifice in battle. Historically, we have remembered those who died in the great wars of the last century — World War I and World War II — or in the Korean and Vietnam conflicts. But we should also recognize that the others who died in our more recent wars, in Iraq and Afghanistan, perished in no less suffering and gave no less a sacrifice. One of the pivotal, and arguably most bloody episodes of the Iraq War was the second battle for Fallujah in November 2004. Early that month U.S. Marines commenced Operation Phantom Fury, an effort to clear the city of insurgents who had taken strategic control of the city the previous February. Fallujah’s 300,000 inhabitants had mostly vacated the city, leaving as occupiers 3,000-plus well-prepared insurgents, identified primarily as Iraqi Shiites, Syrian and Libyan rebels and mujahedeen-jihadists. Most of the residential structures in Fallujah had enclosed courtyards in the back, with double-thick walls and rooftop balconies, making the task of clearing and control difficult and extremely hazardous for U.S. riflemen. In addition, many of the alleyways, side streets and boulevards were planted with mines, booby traps and other improvised explosive devices, and the insurgents had constructed a labyrinth of defensive tunnels that extended for blocks and gave them a tactical advantage. Not of help to the U.S. forces was the willingness of many of the enemy to fight to the death. The assault commenced officially on Nov. 7, 2004, as Marines attacked across the entire northern axis, working south by southeast. The operation was led by Regimental Combat Team “1,” which consisted of two Marine infantry battalions, supported by a mechanized Army battalion. They were designated to assault the western half of Fallujah. The other forces were designated Regimental Combat Team “7,” made up of two Marine battalions and an Army infantry battalion, along with other army and even Iraqi Army units. These forces would attack due south, and then southeast. British units also were active outside the city, keeping infiltration into the city to a minimum. Many of the tactics employed came by way of difficult experience 36 years earlier during another Marine-led assault at Hue City in Vietnam. As coalition forces advanced, building by building, enemy forces would allow entry into many houses, only to detonate explosives as gunfire rained down from stairwells and up from “spider traps” cut into floorboards. In other cases, front and back doorways would be barricaded with first a steel, then a wooden door (heavily booby trapped); the forces who penetrated the building would be welcomed by a fusillade of fire. One of the most intense fights during the 10-day battle occurred at the Muhammadi Mosque in central Fallujah, where Marines found an almost impregnable fortress manned by approximately 200 insurgents. Company B, 1st Battalion, 8th Marines, fighting house to house, battled for 16 hours to capture the mosque, during which time they were attacked by every conceivable weapon, including suicide bombers. After much grit and spilled blood they gained control of the mosque, where they found tons of stored weaponry and munitions, and stores of narcotics for use by the insurgents. The farther south coalition forces went, the more resistance stiffened. Many of the enemy they encountered wore the uniform of the mercenary jihadists who had infiltrated Fallujah the prior year — after the formal war against the Iraqi government was declared over. For several more days the U.S. coalition rooted out the insurgents, ending on Nov. 18, except for the minor mop-up operations that continued well into December. The final tally on coalition force casualties was 95 killed and 600-plus wounded; 51 of the dead and more than 450 of the wounded were U.S. Marines. Many Marines were wounded more than once, returning to duty with their secondary wounds not counted in the official tally. The number of dead among the enemy was placed at 1,200 with an equal number captured, most of whom were wounded. Hundreds of others undoubtedly escaped and avoided capture. The bravery of the U.S. forces cannot be questioned, as two of the Marines were awarded Navy Crosses for valor and many others received Silver or Bronze stars for heroism in action. One of the U.S. Army battalions was awarded the Presidential Unit Citation, for professionalism and performance in continuous combat — an honor, it should be noted, that is not given out easily. On this weekend of solemn remembrance, let us take note of these men who gave their all, and sacrificed much. Cobb H. Hammond writes on military history and is an investment broker with Carty & Company Investments. A different version of this blog post appeared in The Commercial Appeal newspaper in Memphis, TN on May 26, 2013. On War, Marines and BRAVO! Guest blogger and BRAVO! supporter Cobb Hammond muses on the film and associated issues. I have now watched the movie/documentary Bravo at least for the 20th time! It is interesting to note that these young men, most only 18-20 years of age, went through this crucible, and most—the ones who were not severely wounded or killed, continued their tours of duty in very precarious duty, which is not naturally covered within the scope of this documentary. No doubt these men went through some of the most hazardous conditions of any grunt units within the context of the entire Vietnam conflict. Through some further reading I have done on the respective battalions at Khe Sanh, all had literally life-and-death struggles with the NVA prior to and not too long after the siege. There was no ‘long-term’ rest and recuperation time. Many went back to their battalion or regimental bases, caught a few days or a week, and went back at it, usually in the conditions one associates with the “I-Corps” area, typically fighting a well-led, and sometimes fanatical enemy that in that area of Vietnam was very good at what it did. What has struck me while watching this well-focused and received homage to the Marines and Corpsmen at Khe Sanh is the general humbleness of these men and their spirit and muscular bravery. Their nurturing of one another is expected, but the ability to rise above the fray, and the exhibition of the fragility and strength of the basic human endeavor(s) of this episode never ceases to amaze me. They were, and are, gentle in their description of what they and their fellow Marines went through, and to a man obviously do not regret their choice and fate of being in that time and place, and under those sometimes horrific conditions. Conditions that consisted I would assume of extreme loneliness at times, a very basic diet of tasty C-Rations week after week (or month after month if one was tasked to hold the hills above the base), and the constant concern for one’s own mortality, and of course for their friends around them. This is not to mention the obvious conditions of being in a combat theatre, far from any visible means of support, even though it was ever-present, and precarious though it was to provide the basic means of survival for the proud Marines of Khe Sanh. Combat itself, I would assume, is an inexact science, and affects one and all in different and unexplainable ways. It is the ultimate test, and one that apparently these men met, conquered and no doubt won. Winning, even with a desperate enemy wanting to vanquish their presence and existence, in conjunction with poor decisions in many cases coming down from the top, the men persevered. Some I would assume are bitter. Others naturally do not want to speak of it. However, all show their love for their fellow warrior, and at times a general and well-deserved lack of respect (contempt?) for the ones back home who avoided, escaped and even fled their obligation. An obligation to serve their country, but also a test usually reserved for the tempted and the best. It makes them stronger, maybe somewhat calloused—and firm. And the Best showed up, served, and in the end did win. History will show this. It is finally honoring it. It initially did not, but in the end truth wins. 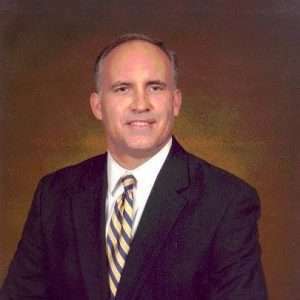 Cobb Hammond is an investment broker in Memphis, Tennessee, who writes military history as a hobby. For questions or comments about this blog you can reach Cobb Hammond at chammond40@yahoo.com. BRAVO! co-director and co-producer Betty Rodgers muses on the summer of 2012’s screening tour. Ken and I have been home from our “Great Adventure Film Tour” for three weeks now, allowing us time to reflect on the experience as we settle back into our lives in Boise. 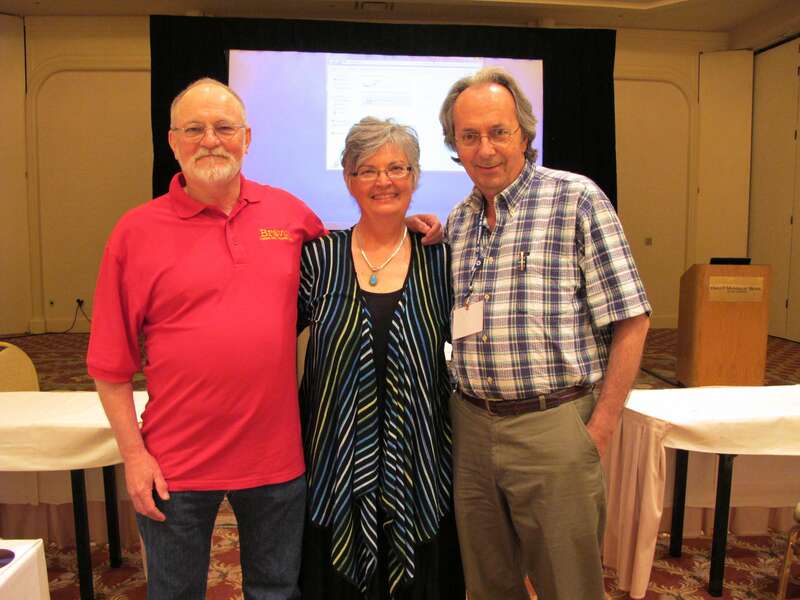 From right to left, Michael Keating, Betty Rodgers, Ken Rodgers at the VVA National Leadership Conference. From there we took the sultry road through pecan orchards and goat ranches to Brownwood, TX, where we were the guests of Mary and Roger Engle, longtime friends and fans of BRAVO! Mary put together a first-class screening at the Douglas MacArthur Academy of Freedom on the campus of Howard Payne University. One of the hosts for the evening was former Marine Gunnery Sergeant Billy Murphey, the local Veterans Service Officer, who arranged for a local Marine Corps League color guard to formally kick off the program. The auditorium was filled to capacity. The editor of the Brownwood Bulletin, Gene Deason, interviewed us and wrote an insightful article about the event and the film. Next we ventured on to lower temperatures in Memphis where we were greeted by our host, Cobb Hammond, a historian of the Vietnam War. Cobb gave us a wonderful tour of Memphis, including the Mississippi River, Beale Street, and a drive by Sun Records. He also made sure we enjoyed the superb BBQ at the Blues City Café, and bemoaned the fact that we were not experiencing typical (sweltering) Memphis summer weather. Thank goodness! Our screening was also hosted by Khe Sanh survivor Skip Funk, and Mason Ezzell at LSI. Guests came from far and wide and included a Korean War veteran. With Ken still behind the wheel, the galloping Honda CRV then transported us to Washington, DC, and the home and culinary sanctuary of my cousins, Chuck and Donna Dennis, who also hosted us two years ago while we did research for the film. 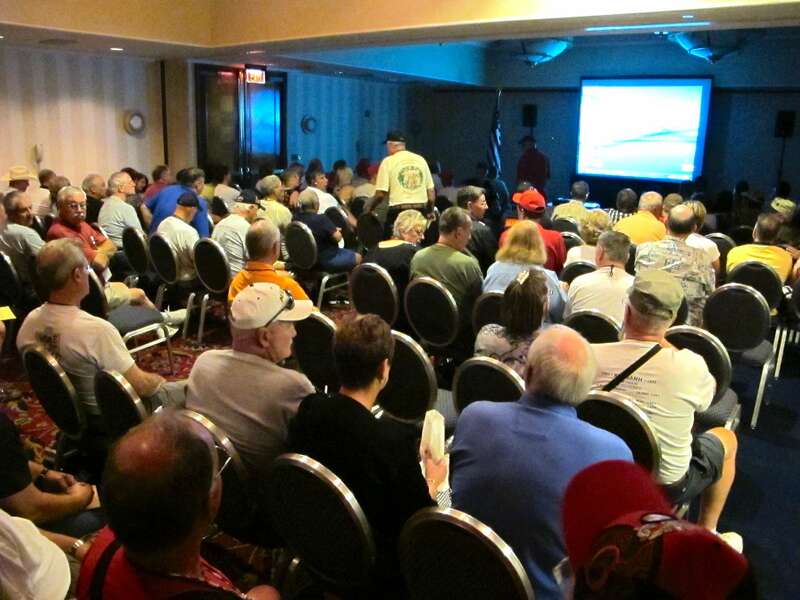 We attended the annual reunion of the Khe Sanh Veterans and screened BRAVO! to a standing-room-only crowd. We were pleased to have three members of the “cast,” Steve Wiese, Ken Korkow and Doc Cicala, in the audience. Our friends Betty and Lee Plevney, Connie and Greg Gibbons, Mark and Elaine Kramer, and Ron Exum each contributed greatly to the success of this event. And then finally, Boston. Beautiful Boston, where we were the guests of Marie Chalmers and the family of Vincent Mottola, a Marine from Bravo Company who gave his life at Khe Sanh. Marie not only hosted the screening, but also gave us a delightful whirlwind tour of the city. BRAVO! was shown at the West Roxbury VA with the assistance of Diane Keith, and a color guard of local Marines. The appreciative audience was comprised of local folk as well as people from southern California to Rhode Island. It was also a special afternoon for families…both the Mottolas and the family of “cast” member Mike McCauley. And then we headed north, then west, happily donning sweaters and jackets in the cooler clime. To say the least, we are exceedingly grateful to those who invited us to their meetings and cities to screen BRAVO! And without the hospitality of friends and family along the way, the trip would not have been possible. Their belief in the film and its importance is responsible for the huge positive response we have enjoyed and will continue to enjoy as more screening requests come our way. Now we are back home and once again searching for a corporate sponsor and/or a distributor. We are making daily contacts to find that one personal connection that will help send BRAVO! out into a national or worldwide audience. And we do so with the glorious memories of our journey. Ken chose to drive the entire way, which concluded at about 12,900 miles. I was the navigator, ice chest and luggage manager, and scribe. Ken was the car packer, itinerary planner, tour guide and historian. To travel with Ken is to learn of people, places and events; to learn of geography, geology and the solar system. Along the way we were able to see migrating snow geese and more than 70 species of birds, plus wildlife such as deer, elk, bighorn sheep, bear, and coyotes, but nary a moose. 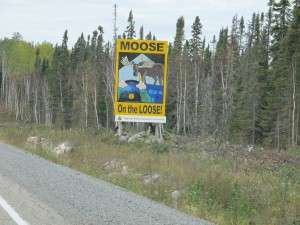 The “Moose-on-the-Loose” signs were posted nearly everywhere in the north like a promise, but one that was not fulfilled. They say it was because we didn’t drive at night. A stand-out for me was the people all over the North American continent who give themselves to history and place and talk about it with great passion and eloquence. There is the person behind the counter at our national parks, the ranger who drives from monument to monument with a speech and armful of maps and photos for each stop, the archaeologist who thrills at the find of the day. There are the greeters at the information centers who welcome you to their country, state, or city. There are the servers at restaurants who talk about what it’s like to live in their towns, and the bus drivers who care about the movement of the icefields and their watersheds. And because we drove eastward through the US, and westward through Canada, we gained a vast knowledge of the beauty of our North American Continent and its people. It was both reassuring and rewarding. And best of all, it gave us an even deeper sense of what every Marine—and every person who serves to defend and protect our continent—is committed to preserving. The night before last, Betty and Ken Rodgers screened BRAVO! to a small but very enthusiastic group of viewers, mostly Marines from differing eras, in Bartlett, Tennessee, a “burb” as the locals call it, adjacent to Memphis. The screening was arranged by Mr. Cobb Hammond, a securities broker, military historian and writer with a lot of familial Marine Corps tradition, and Mr. Skip Funk who was at the Siege of Khe Sanh with H & S Company, 26th Marine Regiment. Skip and Ken Rodgers had the same company commander, Captain Ken Pipes, while in Vietnam, but at different times. The screening was hosted at LSI Inc., which is owned by Mr. Mason Ezzell who was a pilot in the United States Air Force and flew during the Vietnam War. Besides arranging the screening, Cobb toured Betty and Ken around Memphis, to Beale Street, the heart of the blues music tradition of Memphis, along the Mississippi River, and also to Sun Records, owned by the late Sam Phillips, one of the birthplaces of rockabilly music. Elvis started his recording career there, as did Carl Perkins, Jerry Lee Lewis, and Johnny Cash. Howling Wolf got one of his early recording breakthroughs at Sun. The Rolling Stones cut tunes there. It was good to meet the men at the screening. We met a Marine who was awarded the Silver Star for action at Hue City in 1968. We met a Marine who enlisted in 1948 and served two tours in Vietnam. We met a Marine who enlisted in 1954 and served for thirty years. A veteran of the United States Air Force who attended was awarded the Distinguished Flying Cross for his service in Vietnam. Mr. Barry Hart, Marine from Paris, Tennessee, attended. Barry was an early supporter of BRAVO! and personally knows one of the men in the film, Mike McCauley. While Skip Funk was trapped in Khe Sanh with Ken Rodgers and the other Marines and Navy Corpsmen in the film, his father took a voluntary special assignment and left Washington, DC, to fly B-52s out of Guam over Khe Sanh. Father was covering son. He was covering us all. Most of the Marines who attended the screening are affiliated with the Walter K. Singleton Detachment of the Marine Corps League. Walter K. Singleton was a Bartlett/Memphis native who was posthumously awarded the Congressional Medal of Honor for his actions on March 24, 1967 while serving with the 1st Battalion, 9th Marines in Quang Tri Province. The Walter K Singleton Detachment of the Marine Corps League also was an early supporter of BRAVO! After the screening, a number of the viewers rose from their seats and made various comments about war, Vietnam, democracy, the film. After the film, Betty and Ken discussed how these spontaneous moments of dialogue gratify the effort put into creating this piece of history, film, art. Special thanks to the Walter K. Singleton Detachment of the Marine Corps League, to Mr. Mason Ezzel, to Skip Funk and especially to Mr. Cobb Hammond. Last Thursday afternoon, August 9, 2012, Ken and Betty screened BRAVO! COMMON MEN, UNCOMMON VALOR at the Omni in Irving (Dallas), Texas for one-hundred-twenty-five-plus members of the Vietnam Veterans of America. 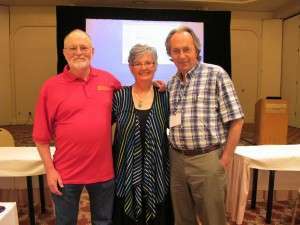 The film was well received and Ken and Betty Rodgers owe a lot of thanks to the VVA and to VVA Veteran publisher, Michael Keating and writer and historian Marc Leepson, who spearheaded BRAVO!’s showing at the meeting. The accommodations at the Omni were more than adequate and each day began with an early morning walk around the Las Colinas surrounds. Ken and Betty visited with lots of energetic folks who are particularly interested in veterans’ affairs, especially those of Vietnam veterans. Several unofficial invitations to screen the film in various locations have already come in from some of the convention attendees. Last Monday evening, August 13, 2012, the film was again screened in Texas, but this time one-hundred-fifty miles southwest of Dallas in Constitution Hall at the Douglas MacArthur Academy of Freedom housed at Howard Payne University in Brownwood, Texas. Fifty-plus folks came and watched and proved to be a fine audience who generously pitched in to help fund some of BRAVO!’s many expenses. The Rodgers were surprised with a visit from Mike and his wife Kelley Carwile. Mike is a Bravo Marine who fought during the siege with the men in the film. Mike and Ken had a great visit, recalling the men they served with and laughing at some of the antics they used to pull. Mike brought lots of photos from his two tours in Vietnam. Much thanks to Ken and Betty’s great friends, Mary and Roger Engle, for ponying up some shelter and chow and for arranging the screening of the film. Much thanks, too, to retired Marine Gunnery Sergeant Billy Murphey, Brown County’s Veteran’s Service Officer, and his Marine Corps League detachment for all their hard work helping us set up and tear down the screening and for posting the colors and conducting the Pledge of Allegiance. Kudos, too, to Dr. Justin Murphy and Ms. Terrie Weeks of the Academy of Freedom for their support. LSI Inc., 2950 Bartlett Road, in Memphis/Bartlett at 7 PM on August 20, 2012. If you live in the Memphis area, please consider attending the screening. Please RSVP with Ken at kennetherodgers@gmail.com if you plan to attend. BRAVO! will also be screened at 1 PM on August 31, 2012, at the Sheraton Arlington Hotel in the Washington DC area. More details to follow. In addition, another showing of BRAVO! will occur on September 8, 2012, in Boston. Again, more details to follow soon. Please contact us if you live in the Memphis, Washington, DC, or Boston areas and if you are interested in attending a screening of BRAVO! Find out more about BRAVO! and Brownwood, TX, in the feature article from the August 12, 2012 edition of the Brownwood Bulletin here. Read former Washington Post film critic Stephen Hunter’s review of BRAVO! published in the VVA Veteran for July/August 2012 here and scroll down one page.